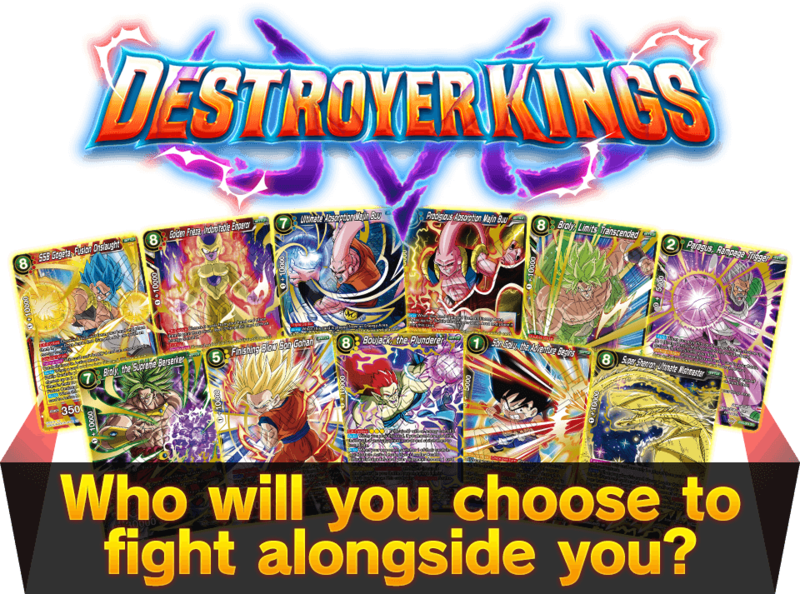 DESTROYER KINGS SR Cards Showdown! This card works great in offensive combos! If you use the 6 cost Gogeta to clear your opponent's Battle Cards off the field, you can easily do 2 damage to them with this card! This card can be used to lock out your opponent! The Frieza Leader from this set can be used to make a diabolical control deck focused on Extra Cards, leading to summoning the 7 drop Frieza for 5 energy, then evolving into this monster! Buu with Gohan absorbed makes another appearance! Play this card from your energy and get a 〈Son Gohan : Adolescence〉card under it, opening the path to take your opponent out with Triple Strike! Buu with Gotenks absorbed is back too! Players can decide which of these two cards to play based on the contents of their Drop Area, and this card can even help get out the 7 drop! The Wrathful one won't be stopped by counters like Mafuba! And the Activate : Battle skill on this one is amazingly powerful! This card's a must-have in Broly decks. Not only can it help get Broly Control Mechanism for you, but its Activate : Main can be used to get Broly cards from your deck and is a key combo piece for playing high cost Broly cards! And this card's for all you old school Broly fans! And look at all those skills! This powerhouse is sure to make a great addition to standard Broly decks. This card has Gohan with his power fully unleashed! It can be used to set all of your opponent's energy to Rest Mode and go in for the win! The Boujack Super Rare punishes your opponent when they switch cards to Active Mode by forcing them to send cards from their hand to their Warp! And you can evolve into it from the 3 drop! We already revealed this card, but you can make a fun deck revolving around Four-Star Ball with it! It's time to re-discover the world of the original Dragon Ball series! And Super Shenron finally makes his grand entrance in DBSCG! And it can be used to stop your opponent completely in their tracks, or to regain control at the end of a game!